We hear and read how the very largest cities are growing, attractive places for millennials and just about anyone who is not of retirement age. The story is that the big cities have had almost all the economic gains of the last decade or so, while the economic life has been sucked out of small towns and rural areas. The images above are what seem to be in many minds today — the vibrant big city versus the dying countryside. Yet, we are in a digital age when everyone is connected to everyone else on the globe, thanks to the Internet. Why hasn’t this theory of economic potential from the Internet been true for the countryside? Well, it turns out that it is true. Those rural areas that do in fact have widespread access to the Internet are flourishing. These towns with broadband are exemplary, but unfortunately not the majority of towns. Professor Roberto Gallardo of Purdue’s Purdue Center for Regional Development has dug deep into the data about broadband and growth. The results have recently been published in an article that Robert Bell and I helped write. You can see it below. So, the implication of the image above is half right — this is a life-or-death issue for many small towns. The hopeful note is that those with broadband and the wisdom to use it for quality of life will not die in this century. When they live in remote rural areas, millennials are more likely to reside in a county that has better digital access. 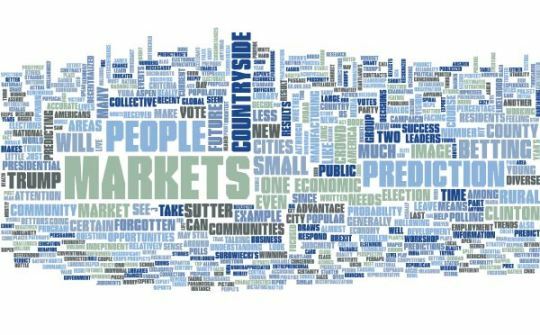 The findings could indicate that the digital economy is helping decentralize the economy, not just clustering economic change in the cities that are already the largest. Sources: USDA; Pew Research; US Census Bureau; Purdue Center for Regional Development This graph shows that the number of Millennials and Gen Xers living in the nation’s most rural counties is on the increase in counties with a low “digital divide index.” The graph splits the population in “noncore” (or rural) counties into three different generations. Then, within each generation, the graph looks at population change based on the Digital Divide Index. The index measures the digital divide using two sets of criteria, one that looks at the availability and adoption of broadband and another set that looks at socio-economic factors such as income and education levels that affect broadband use. Counties are split into five groups or quintiles based on the digital divide index, with group №1 (orange) having the most access and №5 (green) having the lowest. Certainly, that is the mainstream view expressed by analysts at organizations such as Brookings. This type of analysis says the “clustering” of business that occurred during the industrial age will only accelerate as the digital economy takes hold. This argument says digital economies will only deepen and accelerate the competitive advantage that cities have always had in modern times. But other pundits and researchers argue that the digital age will result in “decentralization” and a more level playing field between urban and rural. Digital technologies are insensitive to location and distance and potentially offer workers a much greater range of opportunities than ever before. The real question is whether a rural decline is inevitable or if the digital economy has characteristics that are already starting to write a different story for rural America. We have recently completed research that suggests it is. While metro areas still capture the majority of new jobs and population gains, there is some anecdotal evidence pointing in a different direction. Consider a CBS article that notes how, due to high housing costs, horrible traffic, and terrible work-life balances, Bend, Oregon, is seeing an influx of teleworkers from Silicon Valley. The New York Times has reported on the sudden influx of escapees from the Valley that is transforming Reno, Nevada — for good or ill, it is not yet clear. Why millennials? Well, dubbed the first digital-native generation, their migration patterns could indicate the beginning of a digital age-related decentralization. In addition to looking at generations, we used the Office of Management core-based typology to control by county type (metropolitan, small city [micropolitan], and rural [noncore]). 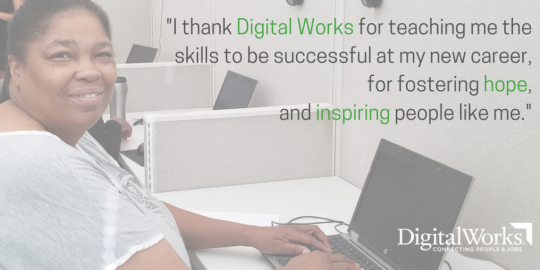 To factor in the influence of digital access affects local economies, we used the Digital Divide Index. The DDI, developed by the Purdue Center for Regional Development, ranges from zero to 100. The higher the score, the higher the digital divide. There are two components to the Digital Divide Index: 1) broadband infrastructure/adoption and 2) socioeconomic characteristics known to affect technology adoption. Looking at overall trends, it does look like the digital age is not having a decentralization effect. To the contrary, according to data from the economic modeling service Emsi, the U.S. added 19.4 million jobs between 2010 and 2016. Of these, 94.6 percent were located in metropolitan counties compared to only 1.6 percent in rural counties. Population growth tells a similar story. Virtually the entire growth in U.S. population of 14.4 million between 2010 and 2016 occurred in metropolitan counties, according to the Census Bureau. The graph below (Figure 1) shows the total population change overall and by generation and county type. As expected, the number of baby boomers (far right side of the graph) is falling across all county types while millennials and generation x (middle two sets of bars) are growing only in metro counties. Sources: USDA; Pew Research; US Census Bureau; Purdue Center for Regional Development. This graph shows population change by generation and “DDI” quintile in the nation’s most rural counties (rural counties that are farthest from metropolitan areas). In rural counties with the best digital access (a low digital divide index), the number of Millennials and Gen Xers increased. To conclude, if you just look at overall numbers, our population seems to be behaving just like they did in the industrial age — moving to cities where jobs and people are concentrated. Rural areas that lag in broadband connectivity and digital literacy will continue to suffer from these old trends. Roberto Gallardo is assistant director of the Purdue Center for Regional Development and a senior fellow at the Center for Rural Strategies, which publishes the Daily Yonder. Robert Bell is co-founder of the Intelligent Community Forum. Norman Jacknis is a senior fellow at the Intelligent Community Forum and on the faculty of Columbia University. 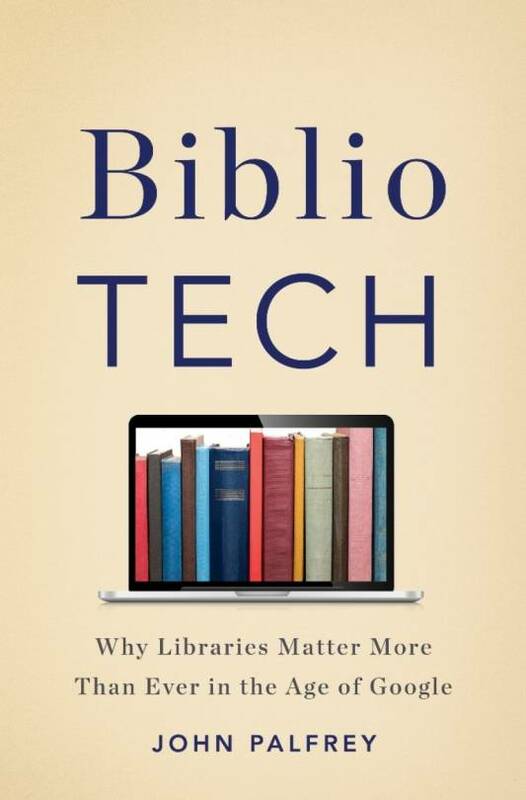 And there was also John Palfrey’s 2015 book, “BiblioTech: Why Libraries Matter More Than Ever in the Age of Google”, which shares some themes of this post. 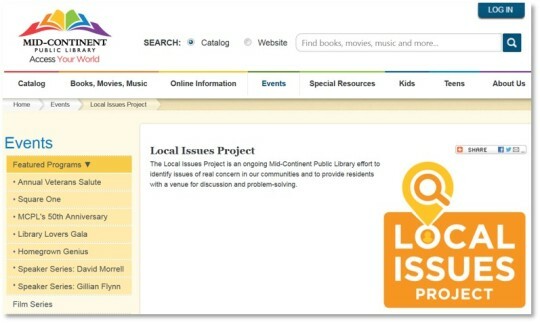 This concern has had such a profound effect that many libraries have effectively curtailed their reference librarian services as people instead “Google it”. No doubt Google is formidable. While there have been ups and downs (like 2015) in Google’s share of the search engine market, it is obviously very high. Some estimates put it at 80% or higher. But the world is changing and perhaps librarians aren’t aware of a nascent opportunity. As the New York Times reported recently about the announcement of the new Pixel phone, Google has noticed all this and is strategically re-positioning itself as an artificial intelligence company. 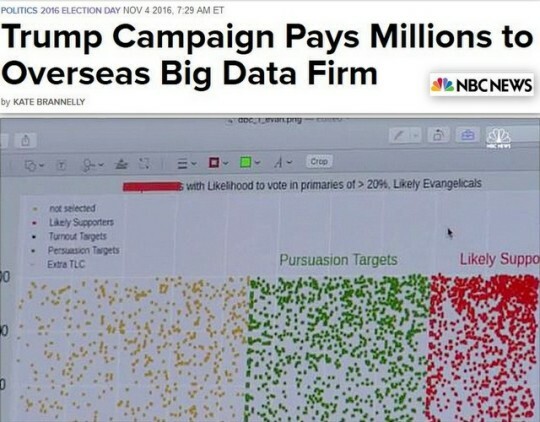 What has this got to do with the Apple story? 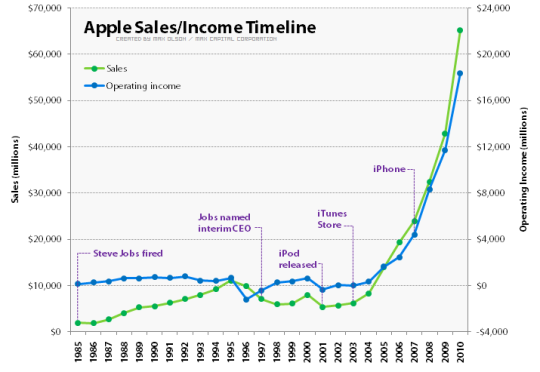 Apple is now the most valuable company in the world. That wasn’t always so. Indeed, it almost was headed for oblivion as the chart shows. Even now, its earlier business of selling personal computers hasn’t grown that much. It was able to add to its mix of products and services in a compelling way. It is one of the great turnaround stories in business history. That history offers a lesson for librarians. 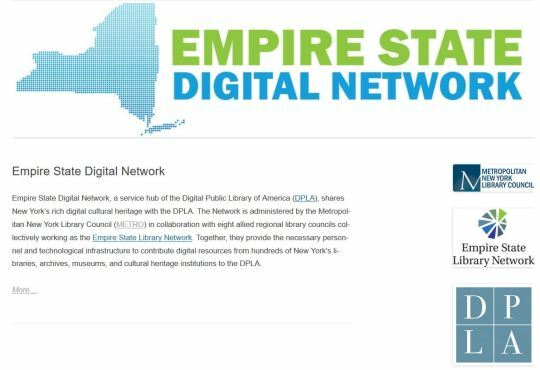 The battle against what Google originally offered has been a tough one and libraries have suffered in the eyes of many people, especially the public officials and other leaders who provide their funding. 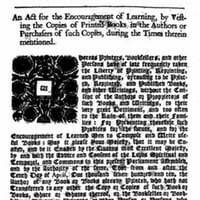 But looking forward, libraries should consider the opportunities arising from the fact that Google’s impact on Internet users is lessening, that the shine of Google’s “do no evil” slogan has worn off in the face of greater public skepticism and that artificial intelligence – really augmented human intelligence – is now a viable, disruptive technology. in a knowledge and innovation economy. 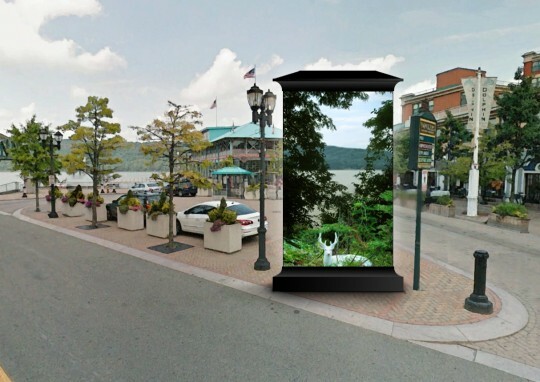 Last week, I posted an overview of a new urban digital experience in the streets of Yonkers, New York. With the ability to project anything you want on a large wall of a highly-trafficked site or on the ground of the historical center square of a city, how do you kick off something like this? 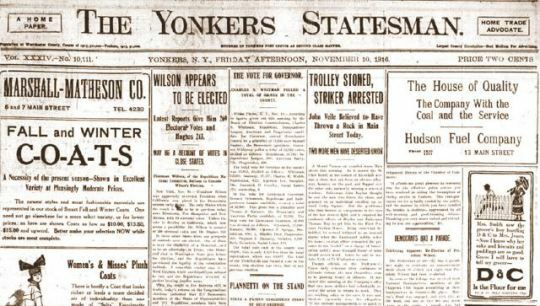 We worked initially with the public library to obtain the front page of the main city newspaper of a hundred years ago. In addition to projecting the front page on the wall of the Riverfront Library building, we created a kind of old time radio news summary of that front-page news, sandwiched between appropriate sounding news bulletin music from years ago. Even when there was daylight and the front-page graphic couldn’t be seen, people could still hear the news headlines. As it turns out, with a Presidential election and the onset of America’s entry into World War I, the days’ news from a hundred years ago was pretty interesting. We also had a variety of short documentaries about the history of the city that were part of a regular weekly program. This included items related to special events. For example, when the annual Yonkers Marathon was run, you could see video of the previous year’s marathon as well as a Pathé news reel about the marathon in the 1930s. There was footage from a drone. We also included features about the business of the city, called Made in Yonkers, that enables residents to see inside the buildings that are normally closed to the public and to learn about the interesting things going on. Indeed, this kind of venue allows people to see inside any buildings that are closed – museums that are closed at night can still show their contents. 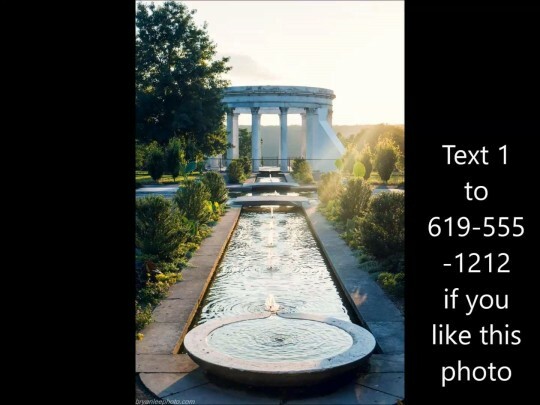 It is also possible to show how a part of the city has changed in the last hundred years or even recently or how it will change in the future – just by overlaying a projection of the past or proposed future. 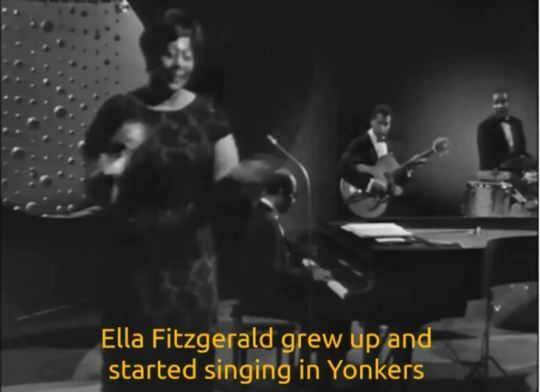 We identified the great musical artists and other performers who had lived in Yonkers – from WC Handy (of early blues/ragtime), to Gene Krupa (jazz drummer) to the singers Ella Fitzgerald and Steven Tyler (local high school grad and originally lead singer of Aerosmith) to the famed comedian Sid Caesar, among others – and put together shows that informed the public of their work and their relationship to the city. Then we wanted to celebrate the creativity and artistry of current residents. 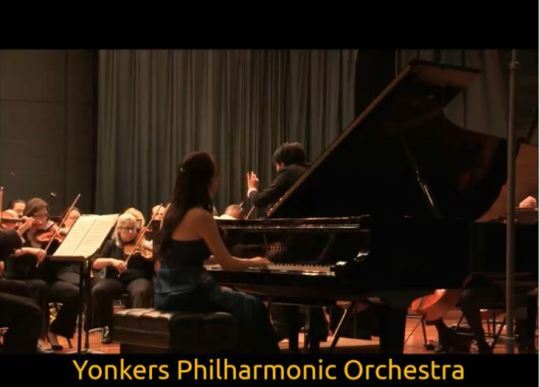 One of the first organizations to cooperate with this project was the Yonkers Philharmonic. On Wednesday nights, you can see them perform if you’re just walking down the street. 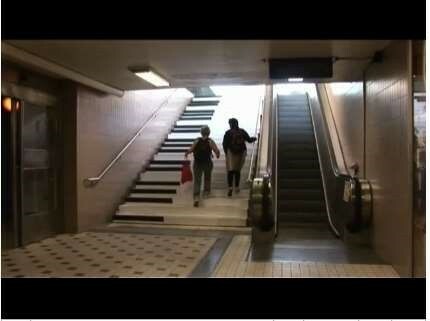 You can also hear them many mornings, while you wait for your train. The relatively new Westchester Center for Jazz and Contemporary Music made an album available. Similarly, Friday nights are usually devoted to musical shows from the two local theater companies and performances from the schools. Yonkers also runs its own Idol contest and the most recent edition of that is also shown from time to time. Yonkers, like other cities, runs various festivals during the year – from Friday night Jazz on the waterfront in the summer, to Riverfest that features folk music, to Hispanic and other ethnic group events. The best performances from those are also shown periodically. when it’s the middle of February and the streets still have snow. It cheers you up! 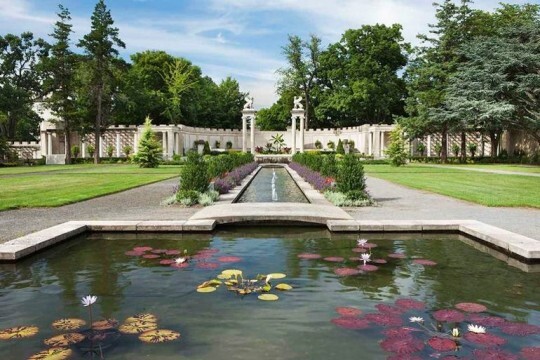 Yonkers is also the home of Sarah Lawrence College and an outpost of Purchase College, both of which are especially strong in the arts. The Westchester Community College also has a branch in the city and its Digital Arts program was an early contributor to the content. These local colleges then provided and even created content especially for this project, including animations, documentary videos and new music. This is only a partial list. 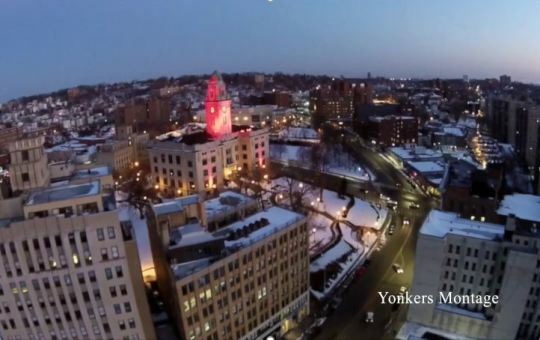 If it had to do with Yonkers, if it happened in the city and helps residents appreciate where they live, then it became part of the content library. That library is still growing. Visual projections on a big concrete wall are pretty straightforward. For the projections on the ground, the same kind of videos won’t quite work all the time and there more emphasis is given to animations, graphics and text. 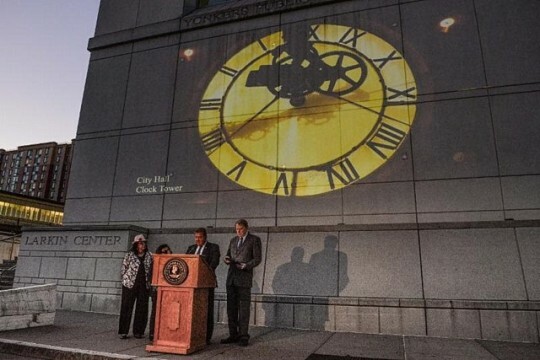 Obviously, visual projections are limited to nighttime. But the speakers are on all day. So, there is a program for the morning and evening rush hour – usually a sample of what had been played the night before. And, for a little fun and to liven up the street, during the middle of the day at random times, pedestrians hear little clips of musical sounds or other ambient sounds, like elephants roaring. Huh? I’m walking in Yonkers and I hear an elephant? That will wake up people who have stopped paying attention to their environment. From some of the examples I’ve given, you also get the sense of how you can transport people mentally. You can show them what’s happening in a different part of the city. You can show them the sunset from yesterday or the flowers of spring when it’s still winter. All of this can uplift the mood of a city. Clearly the focus of the content I’ve described was on this city – Yonkers – but any city could do the same. People, even city government folks, were surprised at how much content there was about the city. Your city too has much to show. You just need to look and be a bit creative about it. But even what I’ve described here doesn’t fully take advantage of the opportunity to create new street experiences. More on that next time. Over the last several years, I’ve written about the value of blending digital and physical spaces for cities so that they can create new exciting, delightful destinations that will inspire and attract people. This was one part of the work I did for the US Conference of Mayors on a strategy to ensure the viability of American cities — especially mid-sized and smaller cities — in a post-industrial, digital age. Mayor Mike Spano, an innovative public leader and dedicated son of Yonkers, New York, saw one of my presentations at an annual meeting of the mayors and thought it would fit well with the revitalization program he had initiated in his city. There’s a lot to this project so this will be a series of posts — an overview in this post and then later more detail about the content and future direction of the project. Yonkers is a city of about 200,000 people, on the northern border of New York City along the Hudson River. It was founded in 1646 during the Dutch colonial period, but grew dramatically during the industrialization of the late 19th and early 20th century. For example, it was the birthplace of the Otis Elevator Company. But like many other similar cities in the US and elsewhere, it suffered during the long decline and out-migration of industrial jobs. As befits a smaller city — and one that didn’t want to have this supported by commercial advertising which would detract from quality of life — the project was very built on a very economical budget. 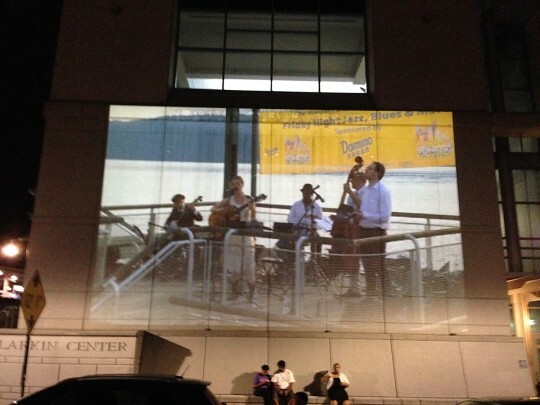 Instead of huge LED displays, like Times Square, it uses high quality projections and outdoor speakers. When it’s dark, the video is seen and engaged. During the day, there is only audio. 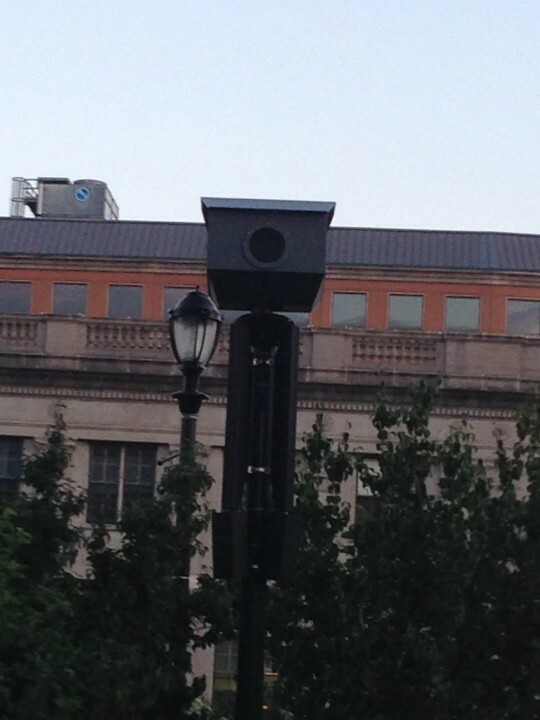 The projectors are attached to existing street lights and are relatively unobtrusive. While the cost of all this technology has come down dramatically over the last few year, it is still not a trivial technology project to implement. The complete system that takes the contributed digital content and ultimately displays it consists of several independent components of technology that are not always simple to integrate. For the initial roll-out, two different kinds of sites were selected and handled quite differently. 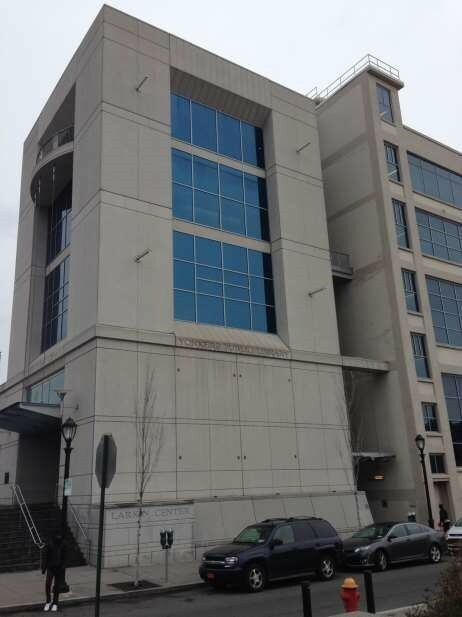 The first site is the large concrete wall of the big Riverfront Library, which is across the street from the main train station and a big city park (with the Saw Mill River running through it). It is also very near the more upscale apartments that face the Hudson River and the Palisades. This is already an attractive area with lots of pedestrian traffic. It is ideal for the presentation of past and current performances, history, and the like in a fairly conventional way. 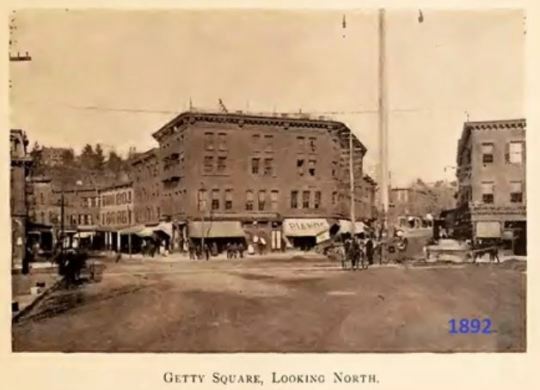 The second location is Getty Square, which was the center of the city a hundred years ago, but is now not quite as important. In this location, there are two projectors with speakers that are aimed at the ground in the center of the “square”. This is an edgier location and one that is expected to be the center for more non-traditional experiments in art and interaction. While there have been projections on walls in various cities around the world, especially in Europe, these have usually been limited to the few days of a festival and have mostly been opportunities for graphic artists to use a building wall as a canvass – rather than to create a new permanent urban experience. From what I’ve seen and read, the closest project to what Yonkers is doing has taken place in Montreal. But in Montreal, the program has been fairly static and solely visual, without sound, the impact on passers-by is limited. Nor does it seem they have any longer-term plans to enable interaction with residents on the street. 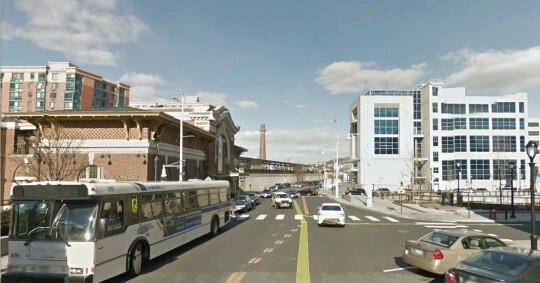 So, the Yonkers Digital Experience is an early experiment in urban design, technology and engagement. The next post will be a review of the kinds of content that is currently part of this project. The final post will highlight where this kind of project can go, as it uses some fun digital technologies. In presentations, I’ve been highlighting the improvements over the last few years in real-time translation between different languages, especially the phone apps intended for this purpose. So, I thought this would be an ideal test to see how well they worked in the real world. 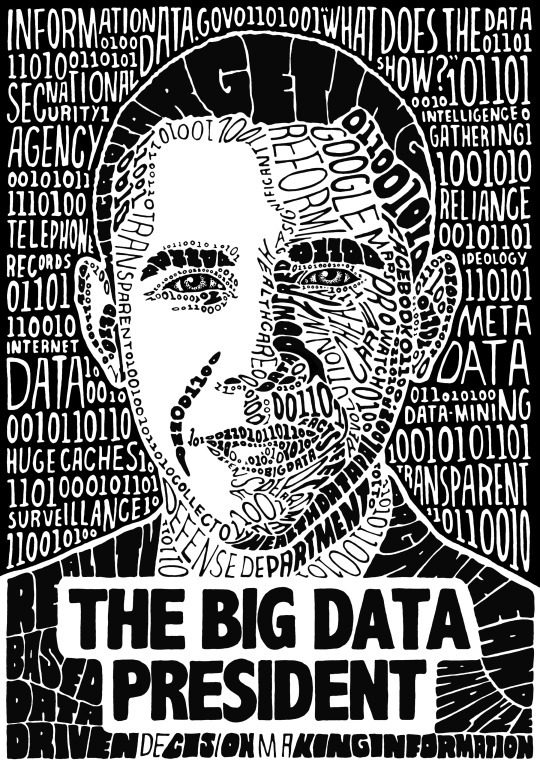 I chose the two leaders – Google and Microsoft – and took them on the road with me. I used these primarily to read menus, signs, information and the like in the foreign (non-English) language and translate into English. I also used it to translate my written English into the foreign language so that a non-English speaker could I understand what I was asking for. I tried a couple of times to use the speech recognition and speech synthesis capabilities of these apps, but that was limited for reasons I outline below. Anyway, here are the results of my adventures in real time translation on the road. Although not as smooth as the videos from the companies would have you believe, these apps generally worked pretty well. Frankly, whatever the limitations, I would have been in deep trouble and frequently lost without these apps. You should check how well each works in a particular country. Google Translate did a better job in France and Microsoft Translator a better job in Germany. 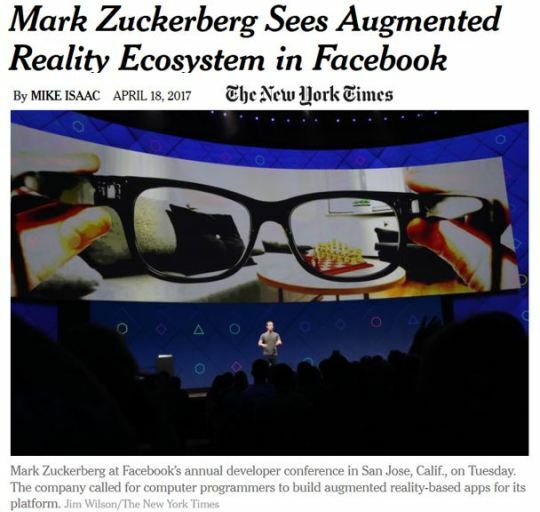 Google bought the company that produced the original WordLens app that allowed you to hold your phone’s camera over non-English text and see it in English – a nice example of augmented reality (AR). That software is still embedded in the Google Translate app. It’s really cool, when you can hold your phone still over foreign text in good light. As a practical matter, this isn’t always the case. 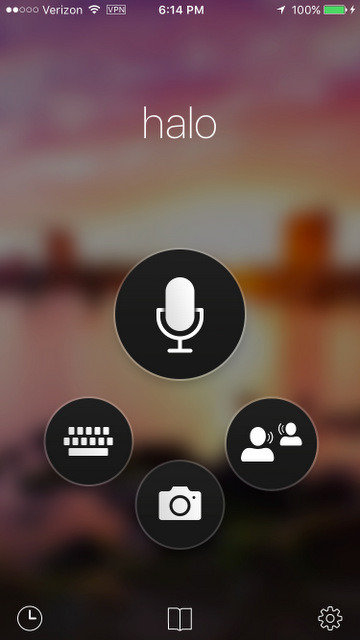 The speech and voice recognition capabilities in both apps require having a good internet connection, something that is not all that widespread when you’re interacting with people who don’t speak English. In hotels, museums and offices where there is available wi-fi, most people speak English well enough. It’s elsewhere that you need the translation capability and it seems there is a correlation between the availability of wi-fi and the percentage of people who speak English in a foreign country – or putting it the opposite way, you usually won’t have wi-fi when you need it to carry the translation duties. So, it is best for both apps to download the complete file for whatever language you’re going to need. For me, that meant downloading fairly large files of Dutch, French and German. 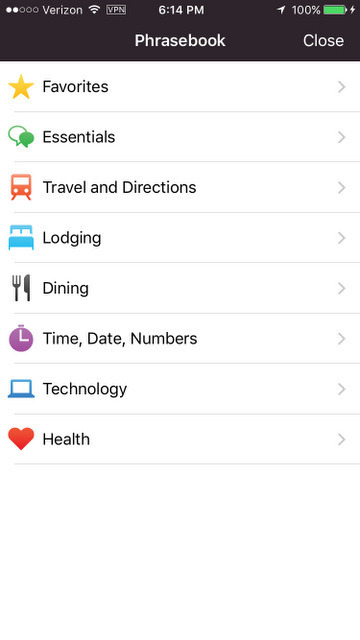 If you don’t download, then you’re going to need wi-fi even just for text. As with any useful technology, you want it to get out of the way and become invisible. While neither is invisible magic yet, Google Translate helps with a nice little trip. If you type in English and then hold your phone sideways (horizontally), it shows the foreign language translation in big letters. This is very useful in explaining to baristas and clerks in mini-marts what you want. Microsoft has a similar capability, but requires an additional step to make it happen. 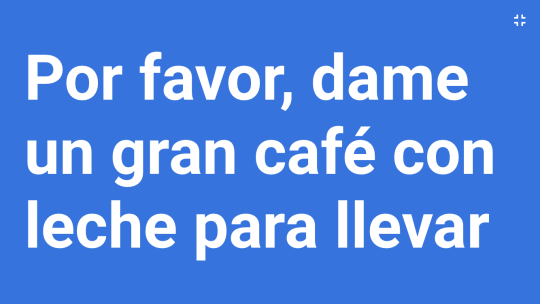 Here is what it would look like in Spanish if you type “please give me a large latte to go”. 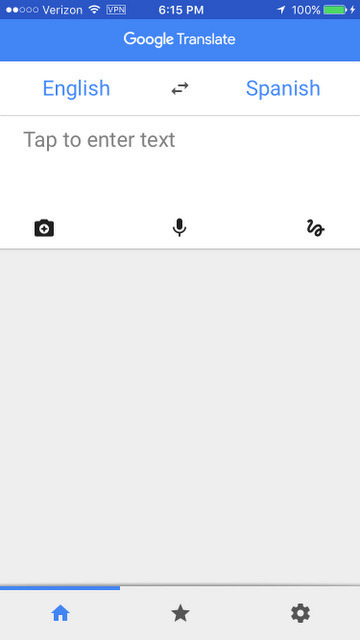 One nice feature of Microsoft Translator is its phrase book. This has many of the basic questions and requests that a tourist is likely to want to communicate. All in all, I’m never going to travel in a non-English speaking country again without these apps. This area of computer science has advanced rapidly over the last few years and I only expect it to get better, especially for offline use. As internet bandwidth gets better, we’re seeing more people communicate by videoconference. Facetime and Skype are now quite common ways for family members and friends to see each other when they are physically separated. Video conferencing has been around for a while in big multi-national corporations. More slowly, we’re also seeing the adoption of videoconferencing for meetings of public bodies. There are various reasons for the slow adoption. Public agencies are unfortunately often populated by the less technically savvy part of the overall population or whose members are just more comfortable with physical than virtual face-to-face communication. Public bodies are also subject to various open meeting laws and rules, which haven’t always caught up with changes in technology. But things are changing, so I went on a search of the video conferencing practices of government bodies. Here’s some of what I found. 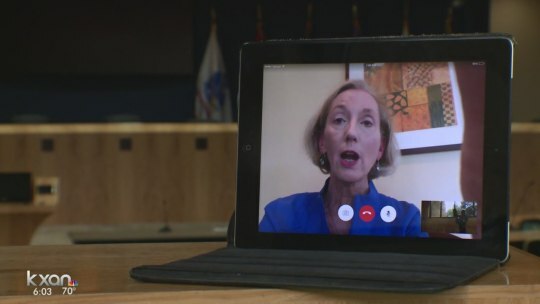 Since the latter part of last year, the City Council of Austin, Texas, has allowed the public to speak at their meetings via video so that citizens aren’t forced to come downtown for this opportunity. A bigger step is virtual attendance at meetings of the members themselves. Video conferencing that would enable members to participate remotely would seem to be a natural solution. But as in all other aspects of the public sector, things aren’t so simple and policies seem to be the first obstacle to overcome. Following a change in the Illinois Open Meetings laws, the Schaumburg Library in 2009 adopted an official policy on this subject. They require a quorum of members at the physical meeting, not counting members participating via electronic means. Once that quorum is established, the remote participants have full rights although their votes are recorded as being remote. The policy also lists the acceptable reasons for wanting to participate remotely – employment, board business, illness, or family emergency. In Texas, school boards also can use videoconferencing, but with somewhat similar requirements for a quorum. Whereas, public bodies in Pennsylvania can count remote participants as part of the quorum. The State of Florida has empowered condo boards, which are a major form of local governance there, to use video. The State allows board members to be counted as present and vote remotely via video conferencing. In New York State, which has some of the strictest open meeting laws, the State has allowed members to participate in meetings by video, but not phone conference calls. The idea is that, as in a traditional physical meeting, everyone has to be able to see all members’ reactions at all times. In addition, New York State looks on video participation as a remote extension of the physical meeting, so public bodies using video must list all locations in its public notices – both the main physical meeting as well as any location where a member is using video. Presumably, someone in a hotel in, say, Florida or France, would have to allow any interested citizens to come into their room and also see what’s going on. I’m on a number of public boards and they have different policies. Some boards are reluctant to use video at all. Another board has just had a completely virtual meeting that worked very well using Fuze and will be repeating this at least twice a year. I’ve also used Zoom successfully for meetings with large numbers of people. Like most adoption of technology, transitions are not smooth and the old and the new exist together. 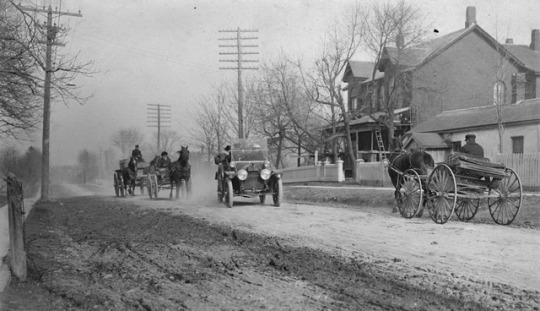 In the streets of cities a hundred years ago, there were accidents between automobiles (then still relatively new) and horses pulling carriages. Why should we expect video conferencing to be different? In the Industrial Age, the fight between labor and the owners of industry (“capital”) was the overarching political issue. As we move away from an industrial economy to one based on knowledge that debate is likely to diminish. Instead, among the big battles to be fought in this century, will be about intellectual property — who controls it, who gets paid for it, how much they get paid, who owns it and whether ideas can properly be considered property in the same way we consider land to be property. 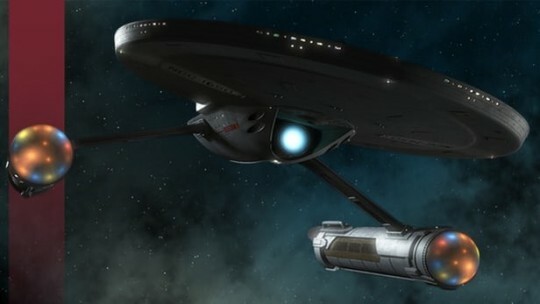 I’ve written about this before, but a recent story about the settlement of a suit by Star Trek was settled recently, as reported in the NY Times, brought this to mind, especially as I came across an interesting series of posts that provide some new perspectives. These were written at the end of last year and the beginning of this year by the former chair of the Australian Film Critics Association, Rich Haridy. Not just in today’s digital world of remixes, but going back to Shakespeare and Bach and even before that, creative works have always been derivative from previous works. They clearly have originality, but no work is even close to being 100% original. The tightening of copyright laws has undermined the original goal of copyrights — to encourage creativity and the spread of knowledge. 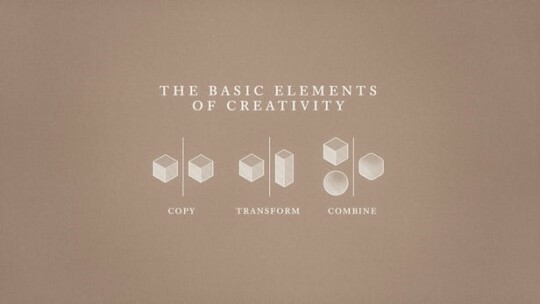 This reflects the failure of policy makers and the courts to understand the nature of creativity. This is getting worse in our digital world. While the creators and distributors deserve compensation for their works, this shouldn’t be used as a reason to punish other artists who build and transform those works. Haridy is not proposing destruction of copyrights. 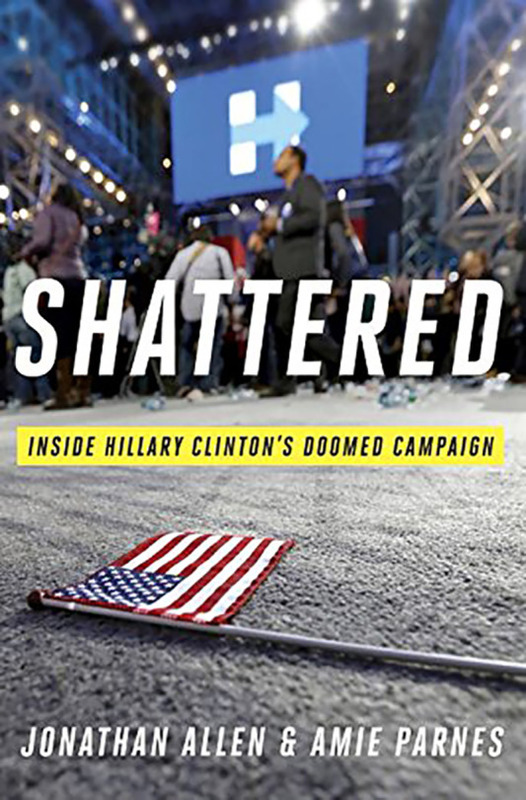 But if arguments, like his, are not heeded, don’t be surprised if more radical stances are taken by others — just as happened in the past in the conflict between labor and capital. 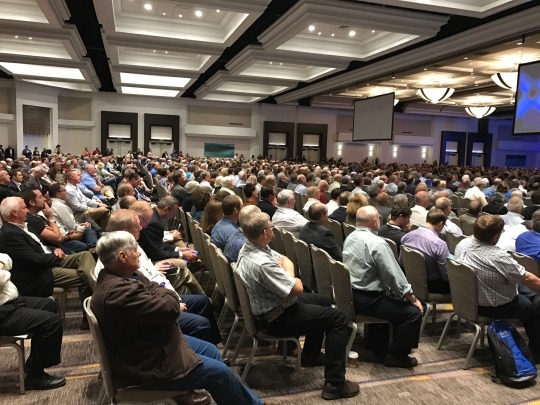 The NTCA-Rural Broadband Association held its annual meeting and expo this week in San Diego with more than 2,000 people in attendance. I was on a panel to discuss the idea of a Virtual Metropolis, a topic I introduced to the Rural Broadband Association and have written about here. The idea is simple. In the pre-internet days, cities — especially big cities — brought together lots of people. Because these peoople were near each other and could casually interact, these cities became hotbeds of innovation and economic production. Along with increased agricultural productivity, this led to the shift of population from rural to urban areas that has threatened many small towns. As a sort of last gasp, after World War II, many small outlying towns tried to substitute factories as a source of employment. In the face on increasing automation and cheaper labor markets elsewhere, that strategy crumbled too. In the last couple of decades, the drop in small town and rural population has increased. Many bright, ambitious young people can’t wait to move away to a big city. And, if you’re an entrepreneur with some great new product or service, it’s easier to start up in New York or Silicon Valley or some other equivalent place. Why? Because no single person has all the skills they need to succeed and it’s easier to find skilled people in those cities than in your small town. When I write this, you may be thinking about high-tech entrepreneurs. But the historic limitations of small town life affect everyone, even artisans or those in other low-tech businesses. This all may sound bleak and many people share that bleak outlook. 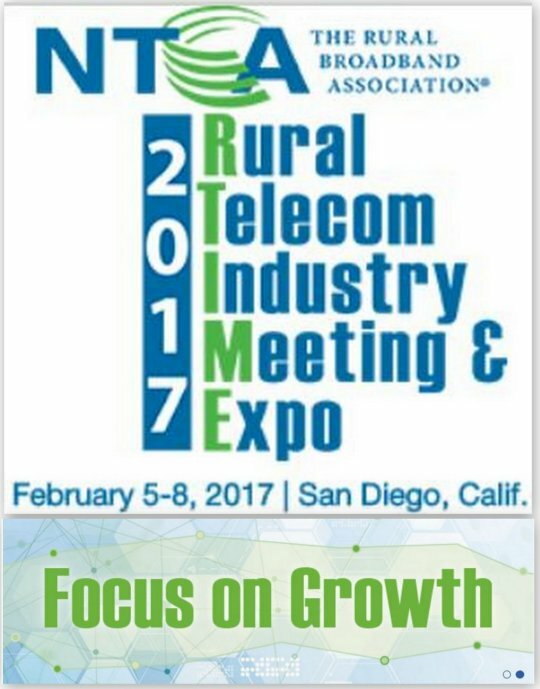 Even some of the members of the Rural Broadband Association can be overwhelmed by this picture. But what I’ve described is about the past, not the potential for the future. In this digital age, if you’re connected by broadband you can live anywhere. If you enjoy country living and love the quality of life there, you no longer need to compromise your economic prospects by continuing to live in the country. We’ve seen some of the positive impact that broadband can have on those rural communities who have invested in broadband, but that impact has not been widespread enough for people to take notice. Partly this reflects the lack of reasonably priced broadband in many rural areas. The Rural Broadband folks are working hard to fix that. More important, there hasn’t been a digital platform devoted to the needs of people in the countryside that would provide a substitute for the casual face-to-face interactions and the breadth of the skill pool that people in big cities take for granted. That’s where the Virtual Metropolis comes in. We are building this platform to make it easier for people in small towns and rural areas to see and talk to each other about how they can work together for mutual economic benefit. Broadband makes this possible because it provides the bandwidth that’s necessary for visual chat. Visual chat is especially critical in helping to establish trust, compared to email, messaging and other forms of communication that are limited to text. The shared small town experience is also an essential basis for mutual understanding and trust. That common experience gets drowned out in the overwhelmingly urban outlook of much larger social media and job services. If even 10 or 15% of the people living in more rural areas join in for business purposes, they will be virtually part of a metropolis of more than five million people. In that way, they can achieve many of the same benefits of physically residing in a big city. In addition to creating and setting up the technology for a Virtual Metropolis, we need to build a community — to get people to participate. In part, that’s where the NTCA plays a key role. They can reach out to the early adopters, the innovators in their regions and let them know that the days of isolation are over. Clearly, from a business viewpoint, the Virtual Metropolis provides their customers and potential customers with a strong business justification for increasing their bandwidth. One of the panelists, Dusty Johnson of Vantage Point Solutions in Mitchell, South Dakota. Despite Mitchell’s selection among the ICF’s Top 7 most intelligent communities in the world, he was initially skeptical as a self-described “cranky old man.” But as he thought about others in Mitchell, particularly his own children and other young people, he realized the value of the idea. The other panelist, Michael Burke, CEO of MTA, the local broadband provider for 10,000 square miles of Alaska is already an unusually innovative leader. MTA goes way beyond merely providing connectivity in many ways, for example providing customer training on new technology and funding coding classes in the schools. Mr. Burke quickly championed the Virtual Metropolis. Of course, considering the distance from the lower 48 and the nature of winter in Alaska, the necessity of being part of a much larger virtual community is crystal clear. essentially war stories in which they are the heroes of the story. So, when I finally had the time to read it at the end of last year, I was surprised to find that this book is one of the best recent books on management. It has been criticized by some as not really having anything new in it and merely reflecting the undue length of time it has taken a general to figure out these things. 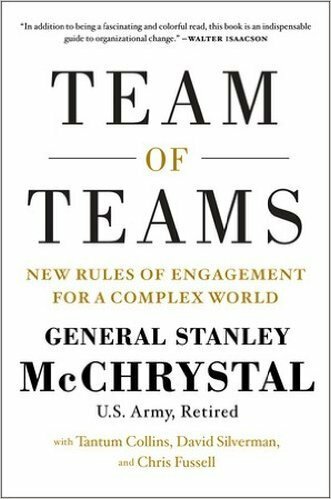 While there is some truth to that, the fact remains that most large corporate and public sector organizations operate in the old style that McChrystal finds inadequate for a new era of change, complexity, and creativity. This includes even highly touted tech companies who reach a certain size and stage of maturity, even while they profess to be using agile approaches. For General McChrystal, it’s a question of what the organization is designed to achieve. 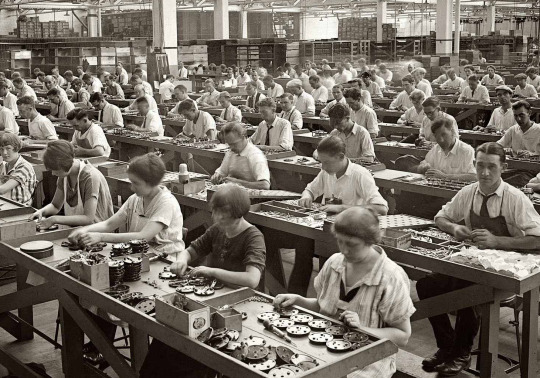 Traditional “Taylorism”, which has been the model of most large organizations, aims to maximize efficiency. As part of that goal, he writes “organizations have implemented as much control over subordinates as technology physically allowed.” That certainly sounds like the traditional image of the Army and many large corporations. Instead, he argues that in today’s world, adaptability is much more important. This is a necessary response to deep and widespread technological changes. He also notes that those same technologies make possible a more modern, more adaptable organization. Although much of what it’s in the book isn’t exactly new, the authors synthesize the material and lay it out to build a story that should be compelling to any senior executive. The value of teams and the use of the intelligence of team members, rather than considering them cogs in a large machine, is explained well. But the real challenge in leading large organizations is how to scale those benefits. That’s where McChrystal and co-authors make a real contribution. A systems approach and a more organic rather than mechanistic view is needed by leaders when looking at large organizations whose units must work together. Each person in the organization needs to maintain a systemic perspective too. Frequent inter-team communication – “shared awareness” of the environment that develops into “shared consciousness” – is necessary to prevent teams from doing things that run counter to the needs of the overall organization. Although this has been well known to organizational researchers for some time, the practice of using physical space to encourage this kind of approach is not widespread. General McChrystal relates his own and other organizations use of common spaces. 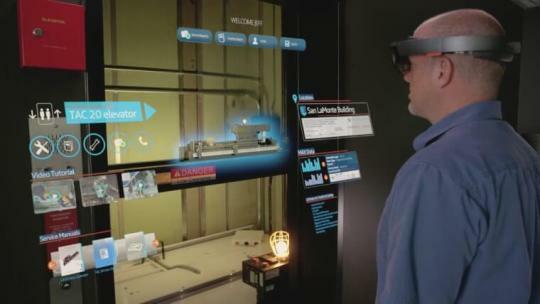 Of course, in a world of increasingly virtual organizations it is especially important to create continuously operating virtual spaces, with full video, to achieve the same effect. This book is an excellent guide to effectively managing large-scale operations to implement a strategy. But, much like the wars that General McChrystal was part of, it doesn’t focus on whether the larger strategy makes sense. That’s not a criticism of the book, just a realization that there are important considerations beyond its scope. It’s the end of the year and I won’t be posting anything new until 2017. Happy Holidays and, no matter how this year was for you, I wish you a better one in 2017!